Are you tired of dealing with a musty smell, excess dust, or a problem with mold in your home or at work? Improve your living or work environment with a portable dehumidifier that works incredibly well. Dehumidifiers are some of the most convenient appliances any household can have. Whether it be for simple air maintenance or mold control, you’re going to want a dehumidifier that is dependable as well as easy for you to use. Let’s have a look at how the iSiLER Portable Dehumidifier stacks up. The iSiLER Portable Dehumidifier is a compact yet powerful solution for removing excess moisture from indoor spaces. As you know, the bathroom is one of those areas that is prone to getting damp as a result of showering and bathing. 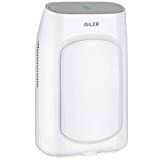 To remove excess moisture from your bathroom or any room for that matter, the iSiLER Portable Dehumidifier is worth it. The iSiLER Portable Dehumidifier is the perfect product for anyone wanting to improve air quality at home or work. Especially for individuals with asthma and other upper respiratory problems, this dehumidifier gets rid of offending contaminants. By removing impurities from the air, it dramatically reduces mold, mildew, and dust. With its easy operation and a full-proof safety feature in the form of an automatic shutoff, anyone can use this dehumidifier to improve indoor air quality. The only downfall is that it only covers up to 269 square feet (25 square meters), limiting its capability to remove airborne contaminants in larger residential and commercial environments. Powerful Operation – Although compact, when operating this dehumidifier under ideal conditions of 80 degrees Fahrenheit (30 degrees Celsius) and 80 percent relative humidity, it covers between 161 and 269 square feet (15 to 25 square meters). Daily, this dehumidifier can remove 1.6 pints (750 milliliters) of moisture. Compact Size – Measuring just 9 x 5.9 x 14.7 inches (228 x 150 x 373 millimeters), its discreet design is perfect for kitchens, living rooms, studies, laundry rooms, nurseries, bedrooms, stock rooms, closets, and more. The design includes a large, detachable 4.2-pint (2-liter) water tank. Dehumidify and Protect – This portable dehumidifier promotes good health, relieves certain symptoms, eliminates musty odors, protects wooden furniture, keeps bedding and clothing dry, creates a cooler space, and eliminates mildew and dust mites. The easy-to-clean filter found in the front air inlet also helps get rid of impurities. Quiet Operation – With an incredibly quiet operation, only 40 decibels while in use, the iSiLER Portable Dehumidifier is ideal for many environments, such as libraries, meeting rooms, baby nurseries, and bedrooms. Warranty – The iSiLER Portable Dehumidifier comes with a three-month unconditional return and replace policy. The purchase also includes a 12-month warranty. The manufacturer has a professional after-sales team that will gladly answer your questions and provide information if needed. Along with an exceptional product, you will enjoy superior customer support. Sleek Design – With a modern, sleek design, you can discreetly use this portable dehumidifier just about anywhere. 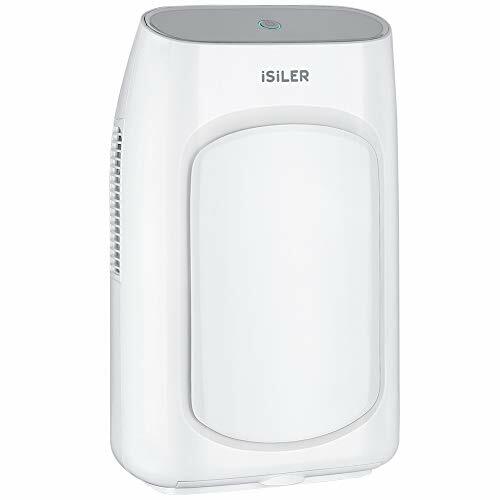 The iSiLER Portable Dehumidifier is easy to use. A simple press of the ON/OFF button starts and stops operation. Depending on the situation, you can increase or decrease the blower speed. The automatic shutoff feature puts your mind at ease. While in use, the indicator light remains green. As the water in the tank fills, the light changes to yellow, followed by shutting off altogether for optimum safety. Although the iSiLER Portable Dehumidifier is an excellent product, it is not large enough for some circumstances. With a 30-pint capacity, the Ivation Energy Star Dehumidifier has more coverage area yet remains small enough to move around with ease. The Ivation dehumidifier can be utilized for areas up to 4,500 square feet. This dehumidifier includes a built-in filtration system intended to eliminate large particles from the air. It can be removed it easily and quickly by gliding it out of the back of the unit.